The DC HEPAbox enters the arena as a complimentary filtration with highest filtration level (>0.15 micro meter). Within the BioPharma, food processing, electronic, car and aerospace industries (just to name a few) there are numerous environments, which need extreme safeguards against dispersion of particles and aerosols. Here the DC HEPAbox enters the arena as a complimentary filtration with highest filtration level (>0.15 micro meter). The change of the HEPA filter is designed to be simple and contamination free. DC HEPAbox is a robust design and withholds high negative pressure (40 kPa). DC HEPAbox is even recommended to be used as a police filter between the filter unit and the vacuum producer in an ATEX environment. 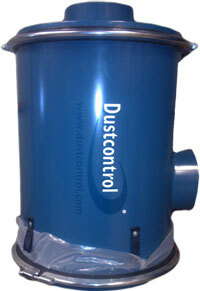 If for any reason the filter unit fails, the DC HEPABOX stops the dust from reaching the radial blower or turbo pump. In this way all standard vacuum producers can be used for ATEX applications, provided that the vacuum producer is placed outside an Atex zone.